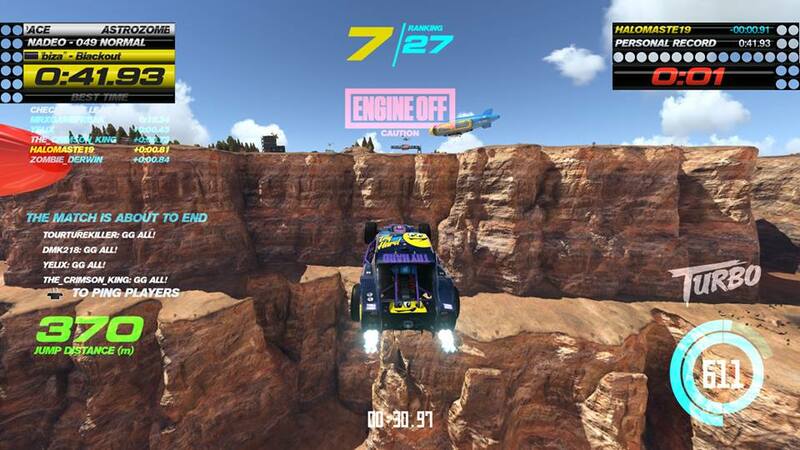 "Fans of EDM, Blimps and Racing, I Have The Game For You!" Years ago I heard of a game called TrackMania. 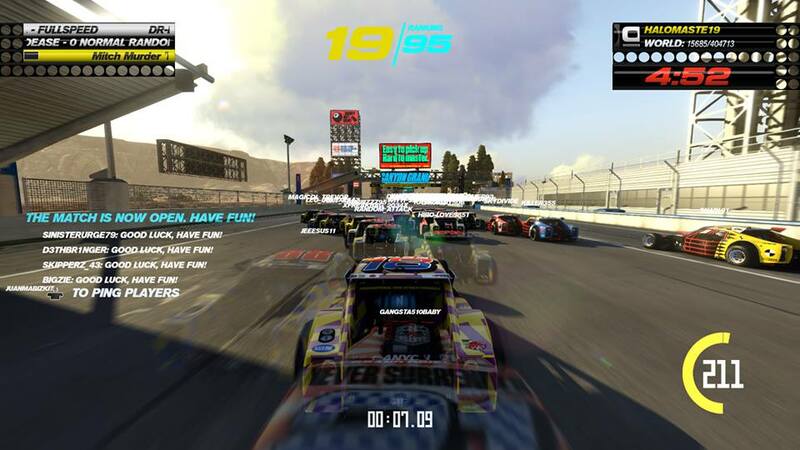 It was a (sort of) free-to-play racing game for the PC. I downloaded it after watching a few minutes of gameplay and what I discovered was a weird but fun racing experience. TrackMania on PC was covered in menus and leaderboards. While racing, it was filled with bizarre tracks, lots of Europeans and tons of dub-step fueled remixes. It was a strange and unique experience, one that I spent hours enjoying. But eventually other games pulled me away from TrackMania and its dub-step remixes. Now Trackmania Turbo has been unleashed on consoles and no one is safe. (Though technically it was already released on the Wii years ago, but that version was missing a lot of what makes Trackmania fun.) So, if you’ve never played TrackMania let me quickly explain what you do in this game. 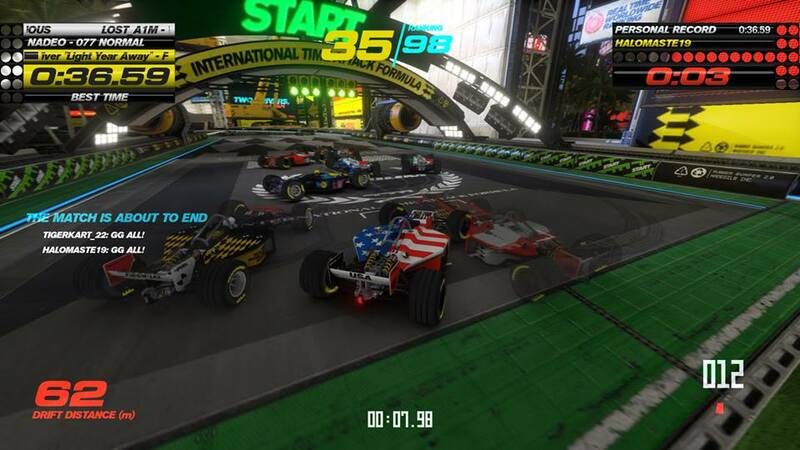 The primary focus of TrackMania Turbo is racing for a set time on a track. You are trying to set the best time and other players are trying to as well. You are all racing at the same time(up to 100 of you), but they are all “ghosts” and none of you can interact with each other. No bumping or grinding. TrackMania is all about setting the fastest time you can. At any time you can reset your run and try again. Once time is up, the fastest player wins and the next track is loaded up and you do it again. 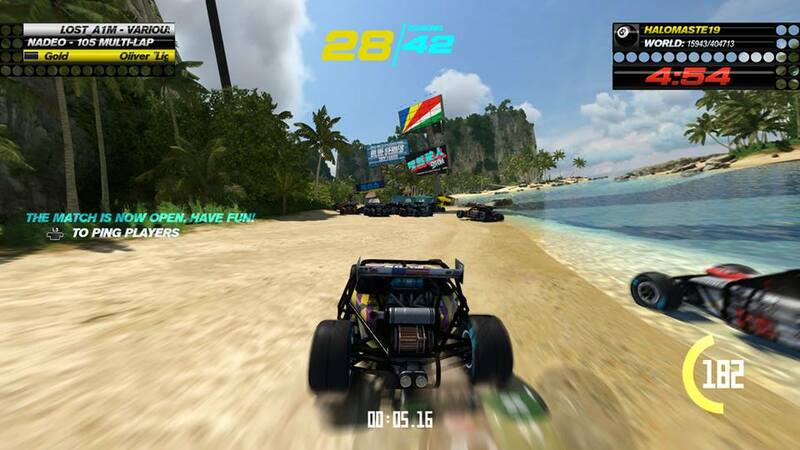 Many of the tracks are made by other players, though Nadeo (developers of the game) have always included tracks they made in the game to use, if you choose to. 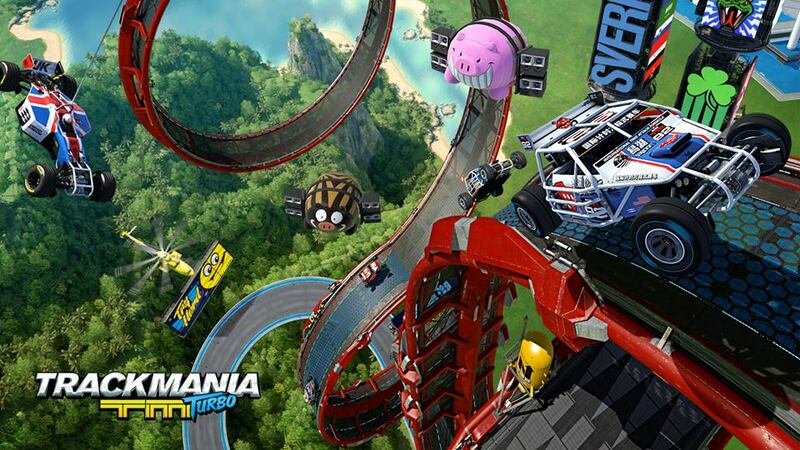 TrackMania Turbo is essentially this, with a few new ideas and a fresh art style. And this isn’t a bad thing, it’s actually a great thing! The TrackMania experience has been (mostly) ported to the consoles and as it turns out, it’s still a lot of fun to drive around crazy tracks at breakneck speed. The key to all of TrackMania isn’t the music or the leaderboards or any of that. No, the reason TrackMania is still around and still tons of fun to play is because the driving has always felt great. TrackMania Turbo is no different. The driving in TrackMania Turbo is a damn near perfect. You always feel in control and there is a sense of precision many games don’t have. But you always feel like you’re just a second away from flying off the track or flipping over too. The faster you go on a track and the better your run, the more tension the begins to build in you. Will you screw this up? What about that sharp turn coming up, will you hit the wall? If you’re on a great run with only a few seconds left before the next track, the tension is even worse. The feeling I got when I drifted across the finish line with a only a second to spare and set the 3rd fastest time in the server was a feeling of pure joy and relief. It’s that mix of joy and relief that I love about TrackMania Turbo. It’s like a high, you crave it and before you know it four hours has passed and you didn’t even realize it. What’s great is that TrackMania Turbo, like previous games, has a ton of tracks to play on, over 300 are included. And more are added every minute. 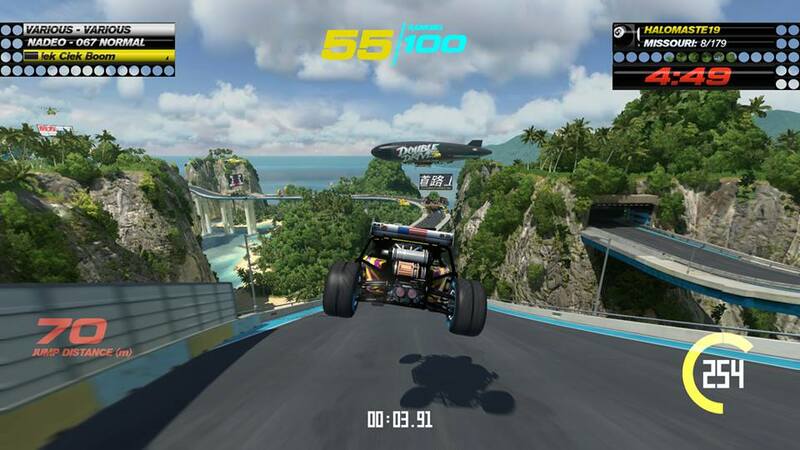 TrackMania Turbo, like every game in the series, includes a track editor which allows anyone to make their own track and upload it for others to play. So every day you turn TrackMania on there are new tracks to try. Many are built for speed and precision, but the editor is flexible enough that you can also build tracks that are filled with giant big jumps. You can make a track that is all about drifting or a even a track that is a giant maze. The editor in TrackMania Turbo is not only flexible but it’s easy to use. You have three different ways to make your own tracks. A beginner’s editor, which is super easy and does most of the work for you. A normal editor, which gives you more options but doesn’t overwhelm you. And finally there is an advanced editor, which takes all the training wheels off and lets you make whatever you want with whatever you want. The controls and menus all felt intuitive and snappy. After a few hours I was making tracks in the advanced editor with ease. I wish the sharing of tracks was easier though. There is no centralized or easy way to see a list of tracks people have made. It makes it hard to find new tracks. I really think TrackMania Turbo needs a mode that feeds you random tracks that people have made. Still, without easy to use sharing tools I was able to find some really fun tracks that people have already made. If you don’t want to make your own tracks you still have access to millions of tracks via a tool that will randomly generate tracks for you. Between tracks you make, tracks included with the game, tracks others make and the random generator, you will never run out of new tracks to play. There are a lot of ways to play TrackMania Turbo. You can race online with others, you can create a private room and race friends, you can challenge other drivers to beat your time on any track, compete in stunt mode which lets you do tricks and flips and more. All of these different ways to play are easy to get into and load fast. There is a snappy feel to everything and slick look to the menus and UI. This is one of the biggest positive differences between this new TrackMania and the older games. The visuals are more polished and have more personality. The aesthetic feels like a nod to the early 90s-late 80s, the music is all electronic dance music and the worlds you race in are filled with color. Everything looks fun and bold. Everywhere you look you can see cat posters, Japanese text, huge flashing neon signs, blimps and it all feels cohesive and cool. The older games could feel sterile at times, TrackMania Turbo feels the opposite and it makes spending hours racing in TrackMania more enjoyable. That's how most of my time felt in TrackMania Turbo, enjoyable. Everything felt great, looked great and worked great. I spent hours not only racing on levels, but also spent hours making my own colorful levels and sharing them with friends. TrackMania Turbo doesn’t have all of the same features that older games had on PC, like custom music, server plug-ins and custom skins. Being on a console limits a lot of that. If those are the things you love in TrackMania you should stick with the PC versions of the game. TrackMania Turbo isn’t going to replace those games anytime soon. But if you don’t mind some of the missing features and want a racing game that is fast and fun, TrackMania Turbo is easily the best racing game on PS4 and Xbox One right now.